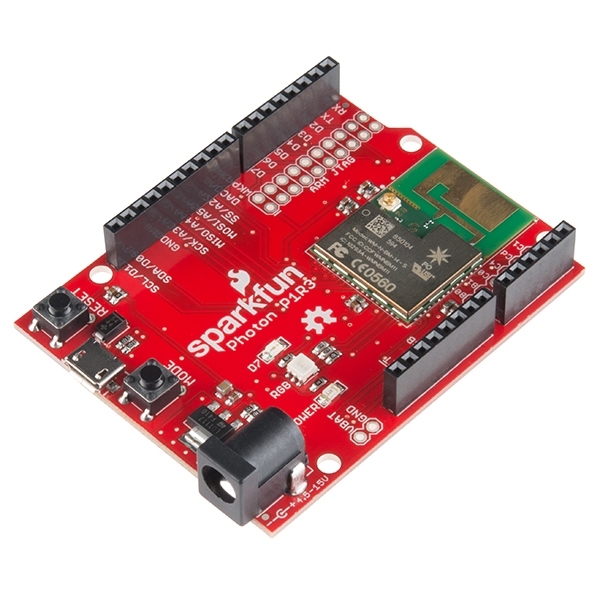 The SparkFun Photon RedBoard has been based around the P1 Spark Module. Each P1 comes pre-loaded with Spark OS firmware and includes their basic cloud service. With a built-in antenna and a uFL connector, the P1 makes it so you don’t have to stress over the optimization of RF designs. The Photon RedBoard has all of the hardware peripherals you know and love: 8 Digital I/O pins, 6 Analog Inputs, UART, SPI and ARM JTAG hook-ups. We’ve also broken out the SDA, SCL, SCK, MISO, MOSI, SS, DAC, and WKP pins as well. You can power the Photon RedBoard over USB or through the barrel jack. The on-board power regulator can handle anything from 4.5 to 15VDC.